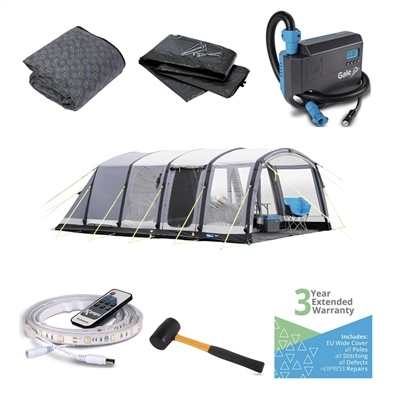 Camping World's Ultimate Packages contain some of the most popular items bought with the Hayling 6 Air Pro Tent. The Ultimate Package is designed to make shopping as easy as possible for your dream tent. Not only this, our Ultimate Packages save you money and come with increased security with our 3 YEAR EXTENDED WARRANTY! The new Gale Electric pump is designed especially for use with Kampa Air awnings and tents. Simply plug it into a 12V power source using the extra long cable, set the PSI required and the pump will take care of the rest. Includes screw on adapter designed exclusively for Kampa tents and awnings. An exciting new accessory for your tent, the SabreLinkTM Flex lighting system ensures you’re never in the dark. The system allows you to link up to three lights together. Each system is controlled by a remote control that allows you to switch the lights on and off and also dim and brighten them. The flexible lights simply velcro onto the AirPoles on our Pro tents. UK Mains version sold. Suitable for other tents using supplied fittings.